Stand out in the crowd with a t-shirt that has the vibrant look and effective promotional appeal you need. 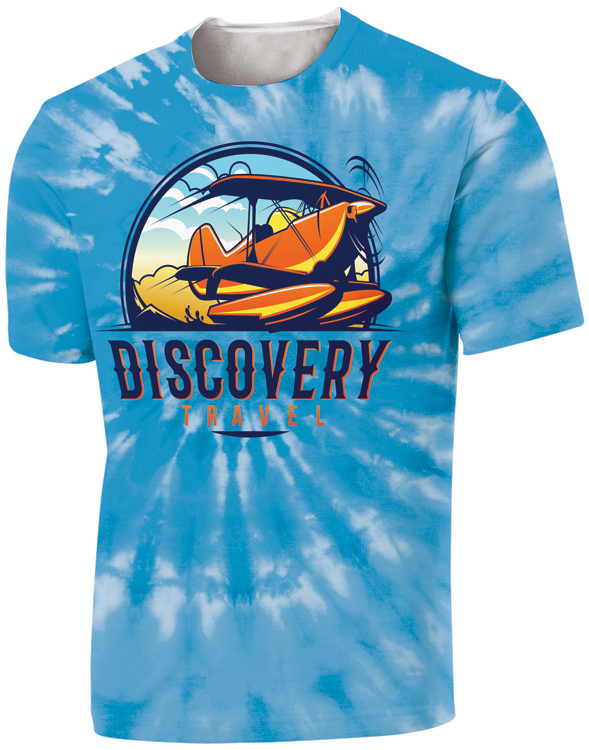 This full-color traditional t-shirt is made using a 100% polyester and features the vibrant, eye-catching look of full color sublimated imprinting. Post-printed sublimation garments are subject to wrinkling/creasing that could result in fabric showing through your graphic. Excellent for cycling teams, athletic team wear, corporate casual wear and so much more! Please note: there is an extra charge for 2XL and 3XL sizes. 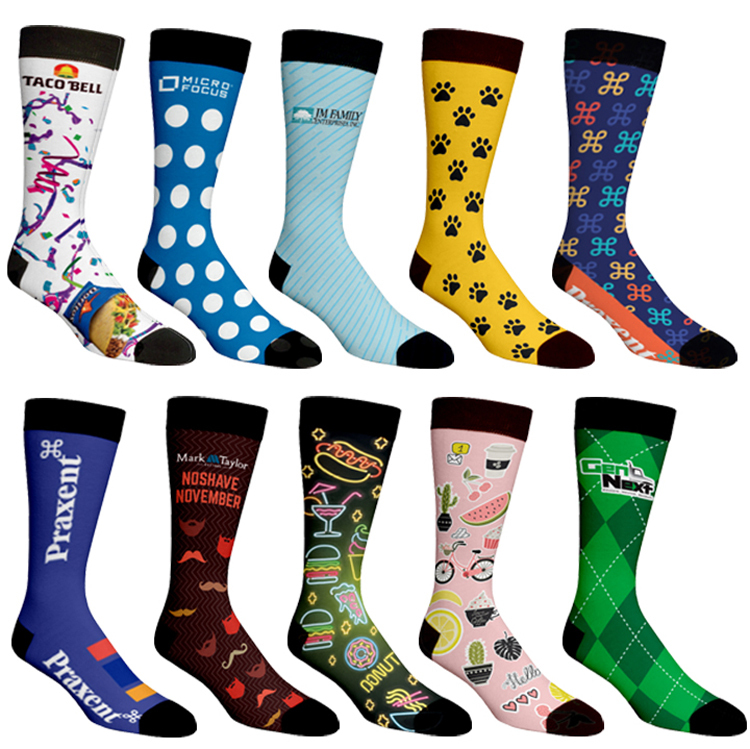 Printed in the USA Add your brand to an everyday wardrobe essential that's sure to get your advertising message out there with these blackout 18" socks. 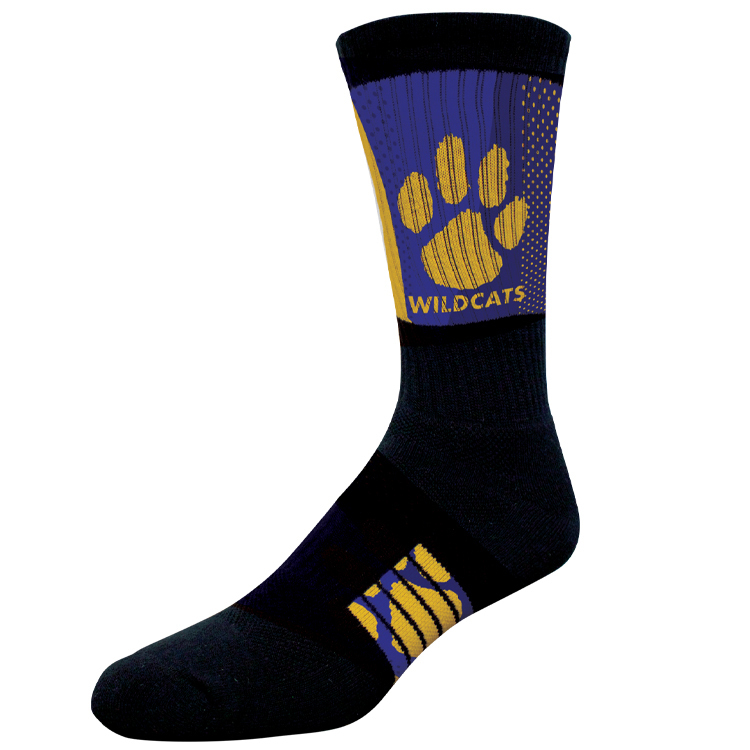 These sublimated socks are sure to get your brand out there and on the move no matter where their day takes them. Normally when sublimating on white socks, the white material from the interior of the sock is visible when worn. The interior of the sock is black, resulting in black lines visible between your art - making this front and back rendering the perfect solution for darker imprints. 24 hr spec sample, free individual packaging included. Printed in the USA This is one of our popular blackout socks. It has black nylon woven on the inside to prevent white grin-through lines. This sock is 23" making it a knee high sock. It is the only knee high sock on the market that will look as good on as it does in the drawer. 24 hr spec sample, free individual packaging included. 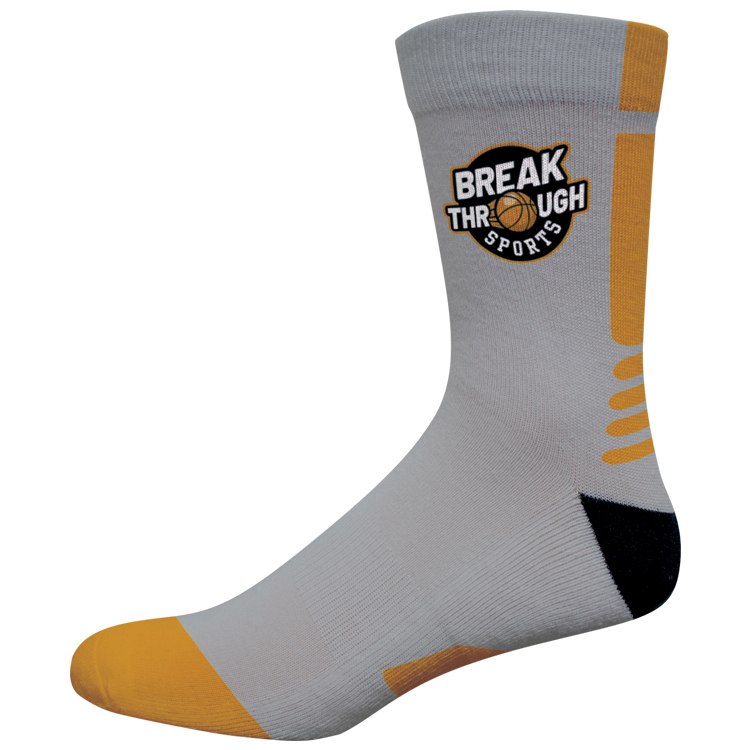 Printed in the USA Go with a promotional wearable that's sure to become part of their regular footwear rotation with this Blackout 18" Tube Sock. 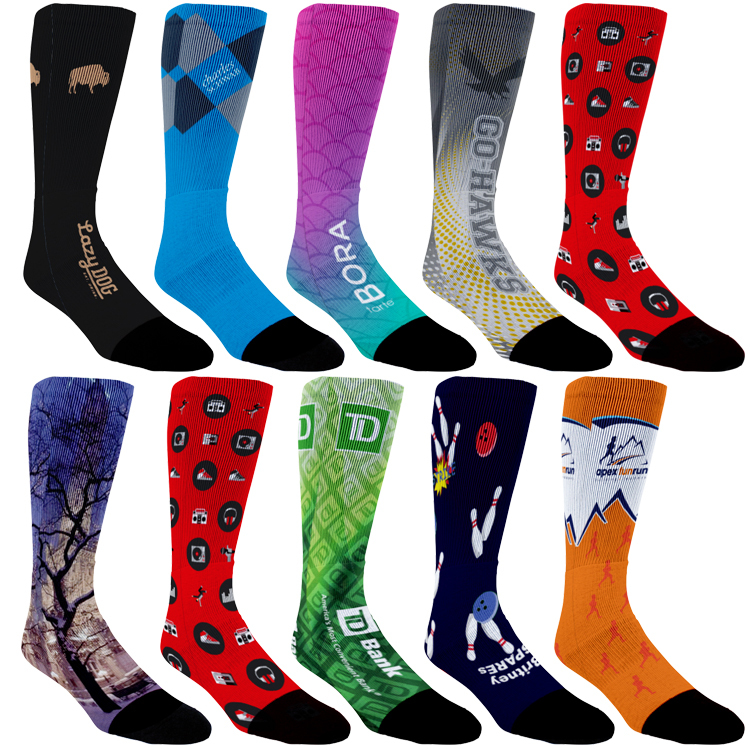 These sublimated socks are sure to get your brand out there and on the move no matter where their day takes them. Normally when sublimating on white socks, the white material from the interior of the sock is visible when worn. The interior of the sock is black, resulting in black lines visible between your art - making this front and back rendering the perfect solution for darker imprints. One size fits most. 10" High from heel 24 hr spec sample, free individual packaging included. 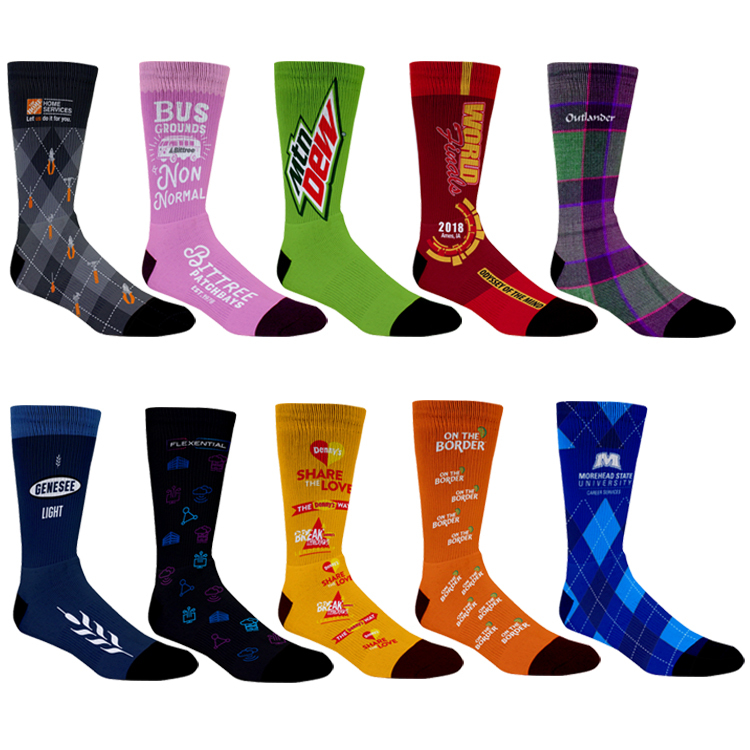 Printed in the USA Make your brand a part of their everyday business casual outfits with the unmatched brilliance of these promotional 11" crew dress socks. Your recipient will appreciate the looks and performance. This is a flat "dress" type sock and measure 11" from the center of the heel to the top. Imprint may distort when the sock is worn. 24 hr spec sample, free individual packaging included. Printed in the USA Add your brand to an everyday wardrobe essential that's sure to get noticed with these econo logo calf height socks. 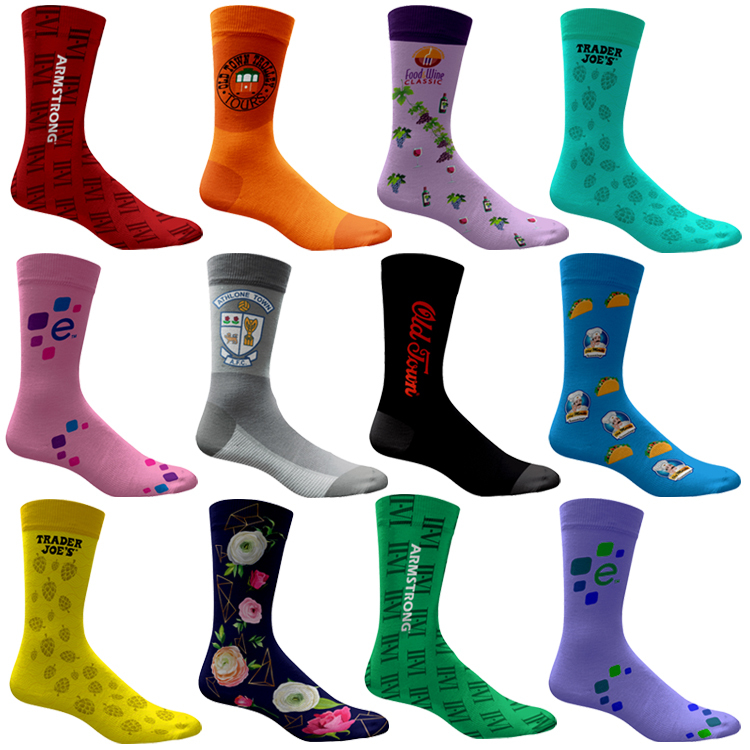 These inexpensive sublimated socks are sure to get your logo out in the public's view when people wear these comfy socks during their everyday routine. 24 hr spec sample, free individual packaging included. These socks are made using a special process that gives us the ability to print art around the entire sock. This means that there is not a place on the sock where the front and back (or left and right) art meet. The result is that there is beautiful uninterrupted art around the entire sock. This process is currently only affordable overseas so these are an import only item at this time. Every inch of this shirt is covered with the art work that you provide. There is art on every inch of this shirt. This shirt is sublimated front then back so there will be a line where the front and back art meet. If requested we can attempt to make artwork meet at that point, but we cannot guarantee every shirt will fit perfectly. This shirt is post sublimated so there may be minor wrinkles where the shirt creases during production. Full color printing is included with the price of the shirt. Please note: there is an extra charge for 2XL and 3XL sizes. 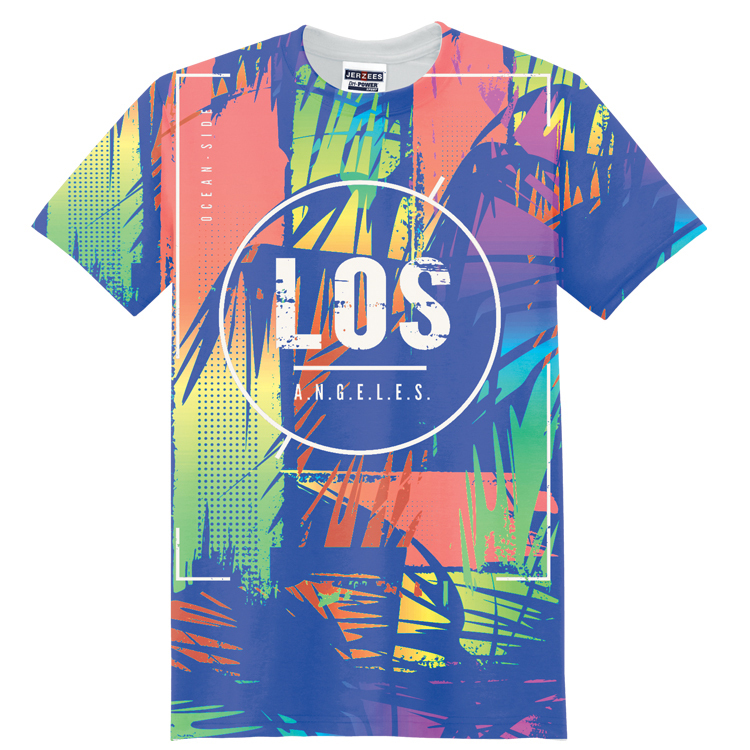 Note: Cotton/Poly Blend Tee Shirt (Reduced Poly content causes colors to look faded). 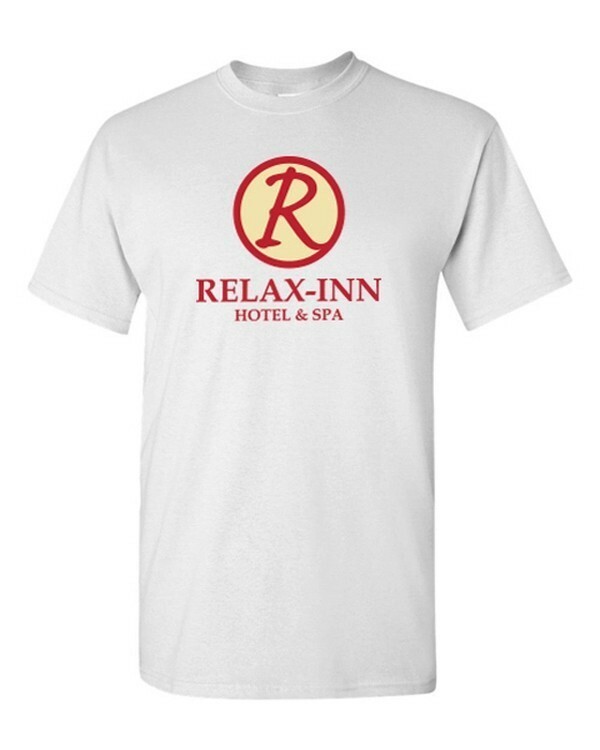 Whether you need an easy casual-wear option for your employees' warm weather uniforms or want to offer clients and customers a promotional classic with potential for excellent brand exposure, this tee is for you. 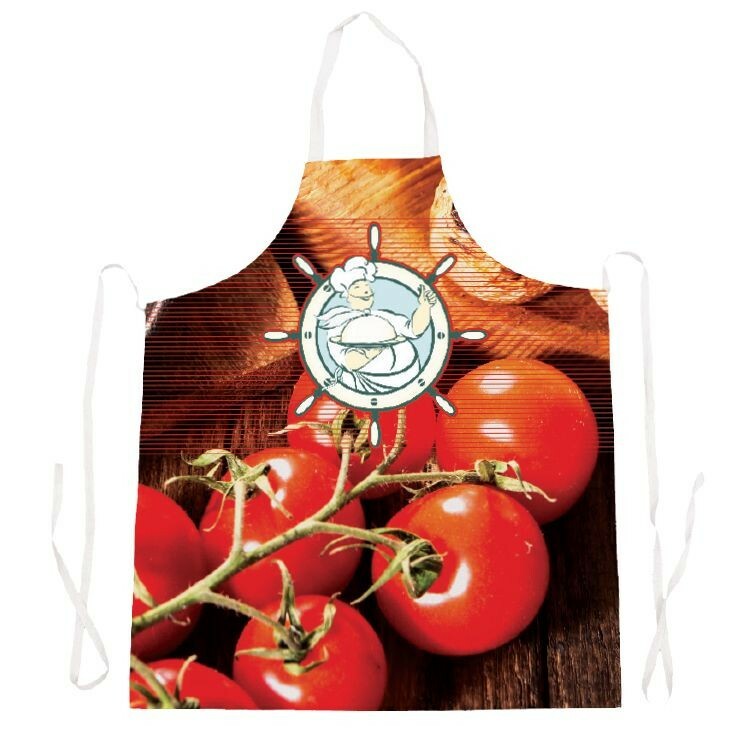 It will feature your silk screened brand on a white, 50/50 cotton/polyester and polyester blend tee for a simple yet effective promotional display that you can count on for prominent display and repeat exposure. From trade shows to in-house apparel, this tee delivers. Add a splash of color to any athletic uniform and hit the playing field in colorful style with the athletic crew length socks. 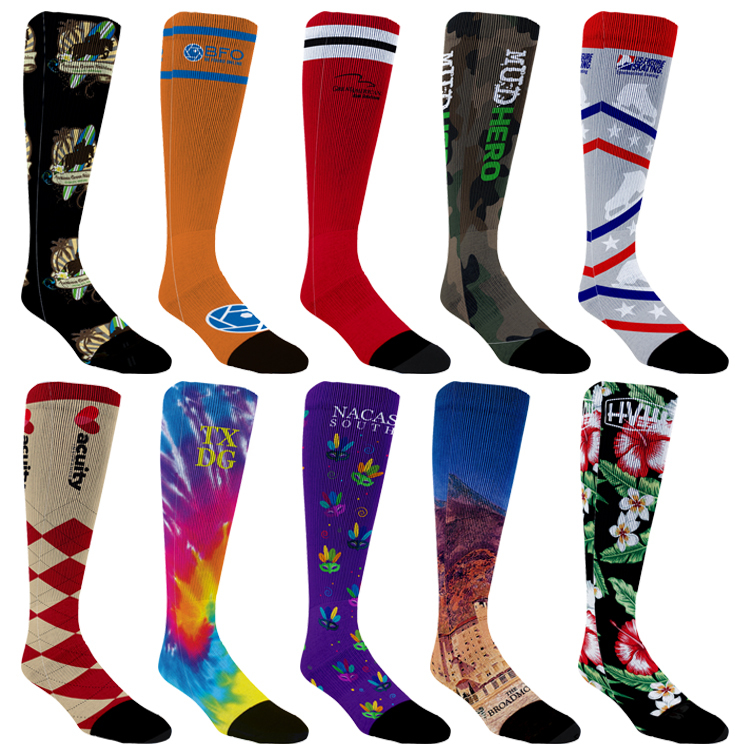 These fully sublimated mid length socks come in medium, large and extra-large sizes, so finding the right fit for your recipient is easy. They feature arch support, antimicrobial treatment, moisture wick-ing fabric and air vents for added comfort and breathability. These socks are decorated to look great in a sock drawer, but the image will distort when worn. 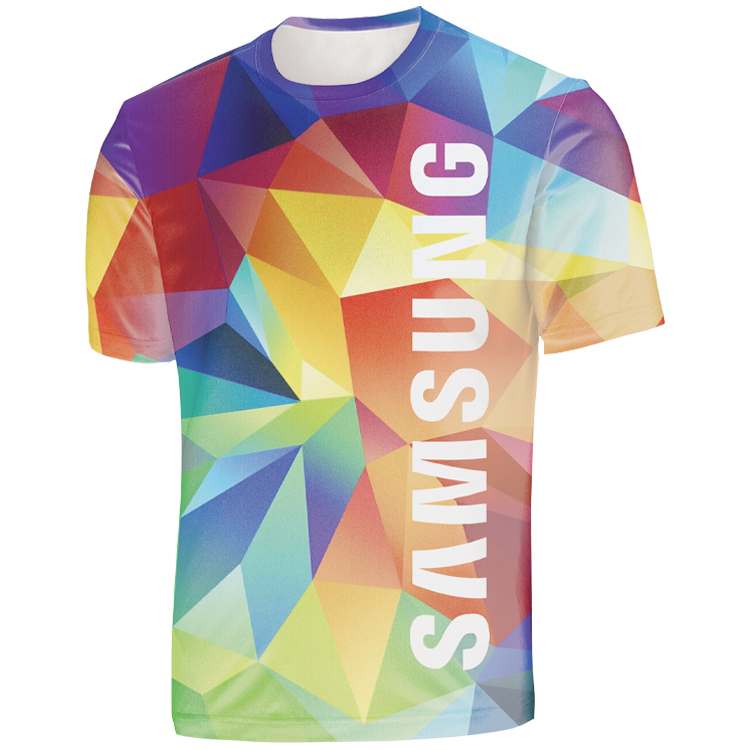 Stand out in the crowd with a t-shirt that has the vibrant look and effective promotional appeal you need. 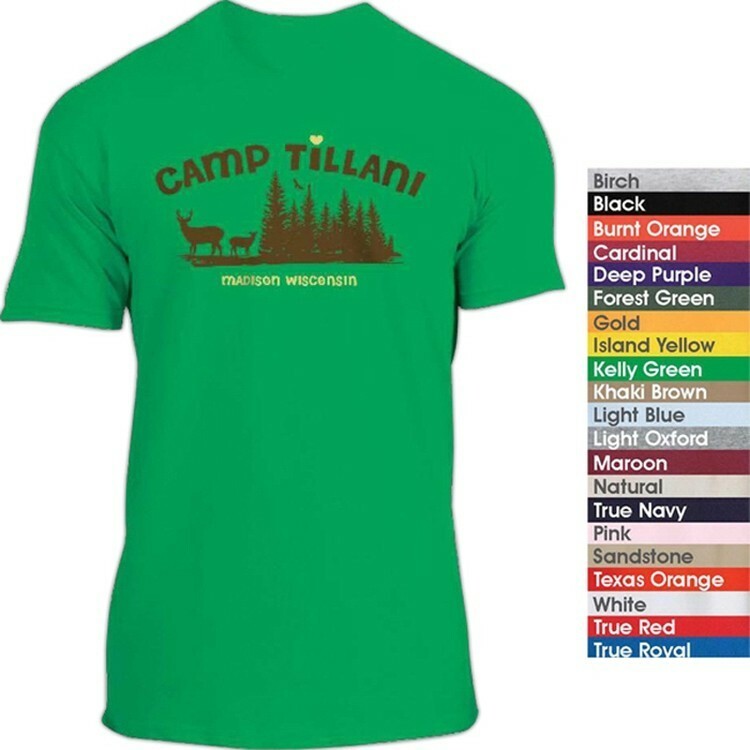 This full-color athletic t-shirt is made using a 100% polyester and features the vibrant, eye-catching look of full color sublimated imprinting. Post-printed sublimation garments are subject to wrinkling/creasing that could result in fabric showing through your graphic. 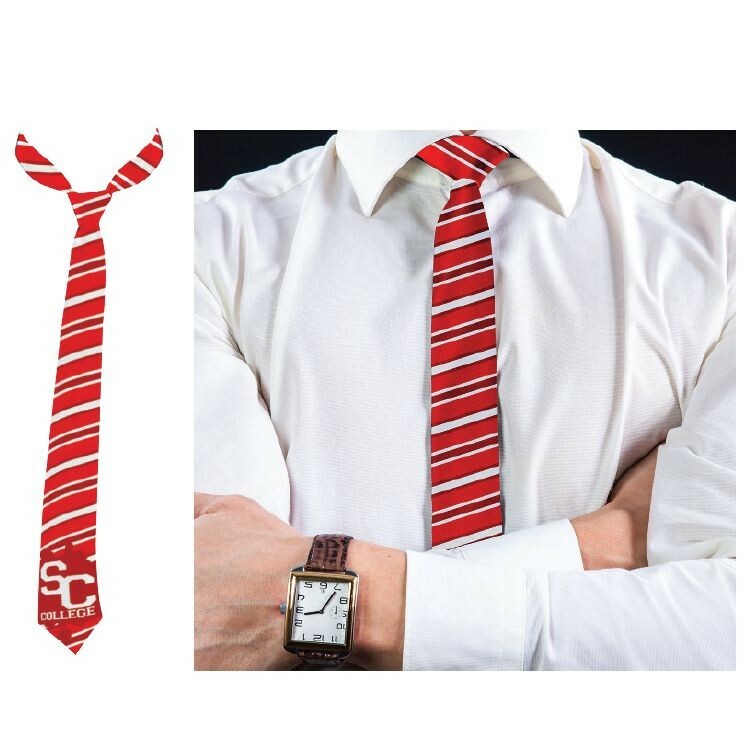 Excellent for cycling teams, athletic team wear, corporate casual wear and so much more! Please note: there is an extra charge for 2XL and 3XL sizes. Every inch of this shirt is covered with the art work that you provide. There is art on every inch of this shirt. 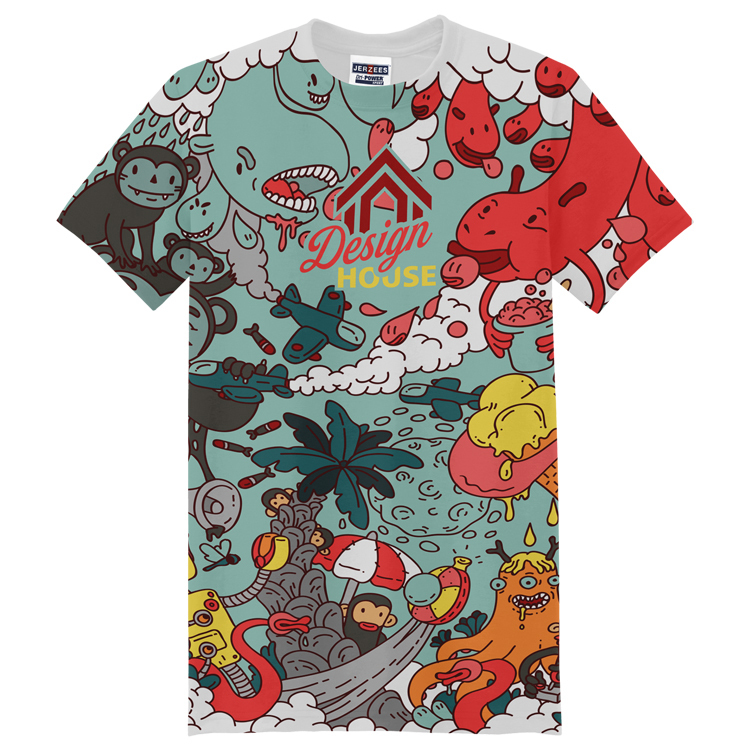 This shirt is sublimated front then back so there will be a line where the front and back art meet. If requested we can attempt to make artwork meet at that point, but we cannot guarantee every shirt will fit perfectly. This shirt is post sublimated so there may be minor wrinkles where the shirt creases during production. Full color printing is included with the price of the shirt. Please note: there is an extra charge for 2XL and 3XL sizes. 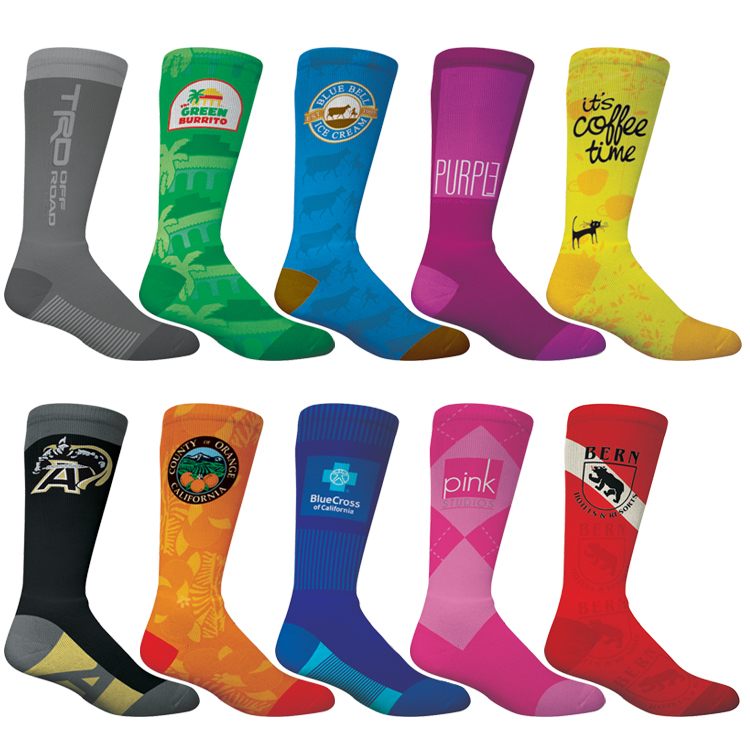 Printed in the USA Looking for a bright, full color dress sock sure to "wow" everyone at your next special event or at the workplace? Our SA108 Dress Sock is a "flat", sublimated sock that measures 11" long from center of heel to the top. This sock features a black toe, heel and top It is made of am antimicrobial + moisture wicking polyester fabric that will help keep your feet comfy and dry! 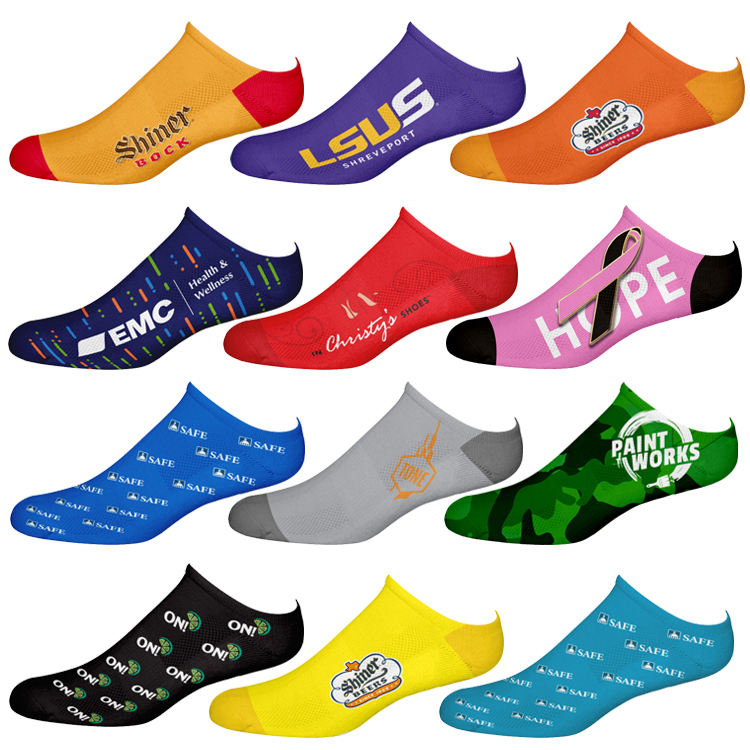 Because we print on these socks using sublimation, we can show off your brand or company with vivid and bright colors from edge to edge. Please Note, Our SA108 Socks have non-printable black heels, toes, and tops. 24 hr spec sample, free individual packaging included. Printed in the USA These long sport socks are very comfy and great for working out. These socks come in medium, large and extra-large sizes, so finding the right fit for your recipient is easy. They feature arch support, antimicrobial treatment, moisture wicking fabric and air vents for added comfort and breathability. 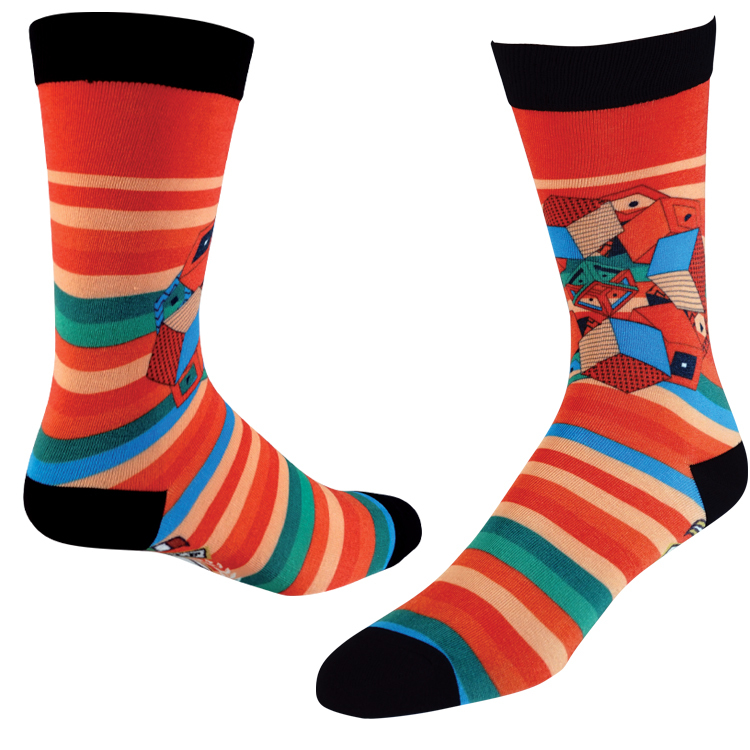 These socks are decorated to look great in a sock drawer, but the image will distort when worn. 24 hr spec sample, free individual packaging included. Hit the road with your brand and offer up an excellent casual style option with the eye-catching look and feel of these full color flip flops. The Flip Flops are 10mm thick and are featured in three different sizes, so finding the right fit for your recipients is easy. They're completed with a thick black strap for a comfortable, secure wearing experience. 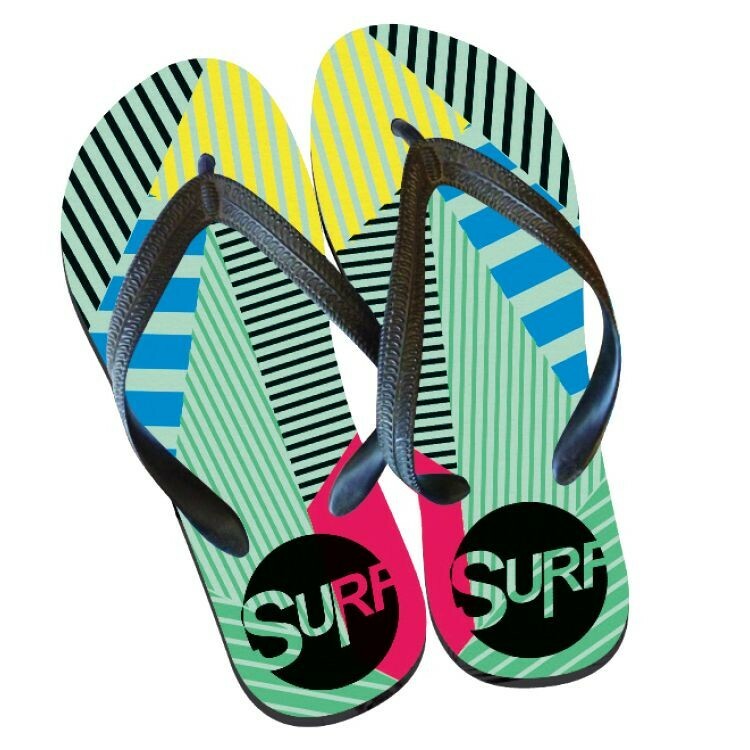 Add your brand with the unmatched brilliance of sublimated imprinting and get feet on the ground when it comes time for your next promotional event with these flip flops! Price includes full color printing. From camp counsellors to greenhouse employee and beyond, if you're looking for an easy and effective way to outfit warm weather employees in something that's comfortable and promotional, this tee is for you. 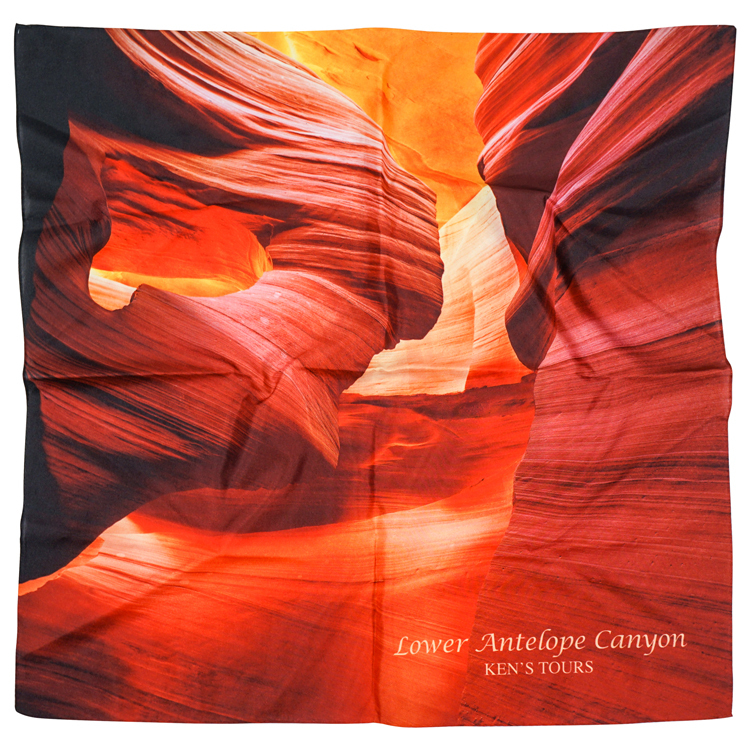 It will feature your silk screened brand on a colored, 50/50 cotton/polyester and polyester blend tee for a simple yet effective promotional display that you can count on for prominent display and repeat exposure. Choose your tee color and gets started today!